From the very first day I had my iPad, I tried to find a way to copy original language biblical text from any applicable app to Pages for the iPad. I couldn't find any app on the iPad at the time that allowed me to do this, but had to resort to loading a document on my Mac with Greek text from Accordance and then transferring it to the iPad. Therefore, I'm very thrilled to see how easy this is to do using Olive Tree's Bible Reader for the iPad (full review forthcoming). Copying text is quite easy. You touch the verse number and a dialogue box appears offering a number of options, including text copy. Selecting that allows you to specify one or more verses. I found that the Greek text could be moved around, but I could not compose in Greek. The text as shown above is in the Helvetica font (the default in Pages), but if someone wanted a more serifed look, it can be changed to Times New Roman with results that look similar to the text as originally displayed in BibleReader. Unfortunately, my attempt to copy Hebrew text was unsuccessful. I could copy the text in BibleReader, but when I tried to paste in Pages, nothing came through except the verse reference. This isn't a flaw in either BibleReader or Pages, but relates to the iPad's current lack of a Hebrew keyboard. Although I was able to transfer a document with Unicode Hebrew from my computer to the iPad when I tried a month ago, I found this text to be nearly unusable as it could not be easily manipulated. My hunch is that like on the iPhone, we may have to wait a year or two (or at least until the iPad goes on sale in Israel) before Hebrew is easy to work with in Pages. 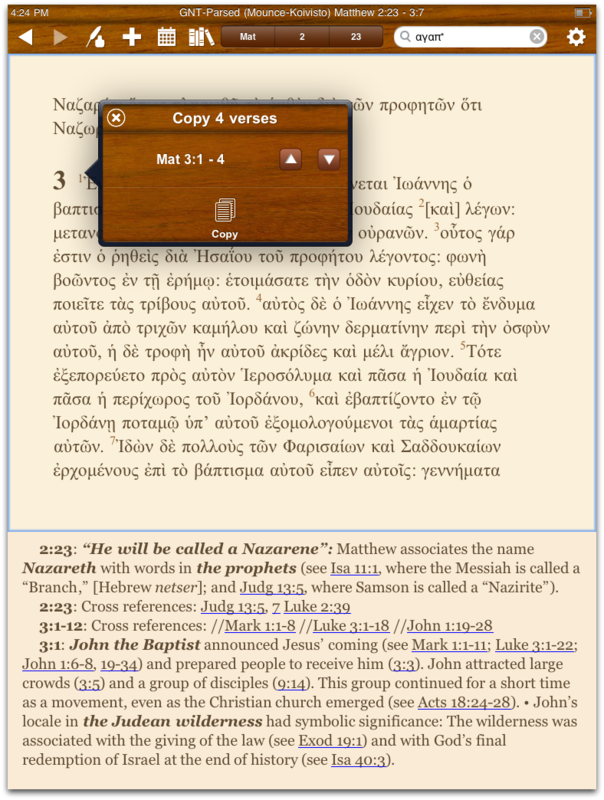 Regardless, the ability to at least work with Greek text from BibleReader in a word processor moves the iPad one step closer to becoming a tool for serious academic work in biblical studies. I was also delighted to see that the text in BibleReader remains in the same place as it did when I switched to Pages. That means that even though there is no true multitasking on the iPad (this will change in the Fall), there is no real difficulty in going back and forth between the biblical text and a word processor. Looks like you found a bug. Copying Hebrew text is broken. It used to work, not sure what happened. Even if you could copy it, I am not sure how pages would handle it. We will at least look into getting copy fixed. I tried pasting it into the regular Notes app, too. No luck. I just assumed it was the iPad. How are able to use BibleReader for iPad, it isn't available yet in the app store? Aside from that, it looks amazing. I can't wait to play with it. It looks like I will be able to do the majority of my research and sermon prep straight from the iPad (with the help of the wireless keyboard of course). Shawn, I have a preview beta of the app. You're right that it does look amazing--and it is. And I have no doubt that you'll be able to do your sermon prep with your iPad. How did you get a beta version? I asked for a copy but I may have asked to late. This is the app that I check for every day. They have a small number of slots open to them (it's an Apple thing). I've been a beta tester since the beginning of the iPhone version.